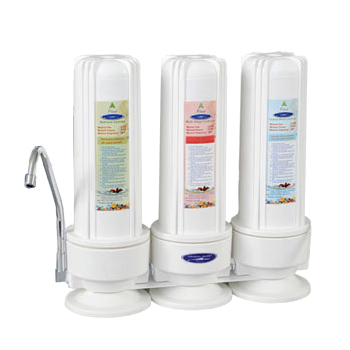 All countertop water filters come with a diverter valve that is attached onto the faucet. A filter is installed next to the kitchen sink. 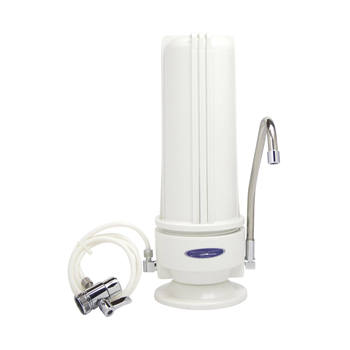 Water will be flowing either through a separate faucet attached to the filter (all models of Crystal Quest and Paragon filters), or through a second opening on the diverter (Aquasana). Outside Thread: No adapter should be needed (see Fig.1), proceed to step 3. Inside Thread: Select the correct adapter and washer (included, see Fig.2) and screw into faucet. Tighten by hand. Note: Adapters are included with each countertop filter which will fit most faucets, excep non-standard and designer faucets. To create a tight seal, you may need to use a gasket from your faucet's aerator in addition to the washers included with the adapters. If the adapters do not fit, consult your local plumbing or hardware supplier for assistance in obtaining the correctly threaded adapters. 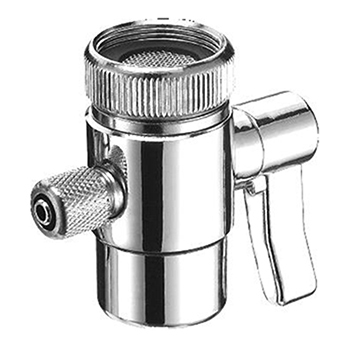 Attach diverter valve to a faucet, turning swivel collar to tighten. 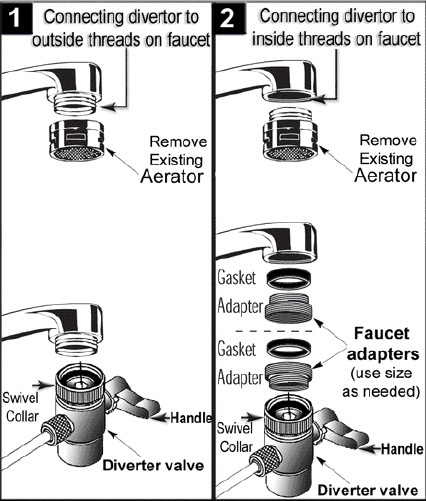 Make sure that gasket inside diverter is positioned securely between the valve and a faucet. Rotate diverter valve to a desired position. Swivel collar may need to be re-tightened. Turn on water, it will go through a faucet as usual. Turn diverter handle or pull diverter knob, this will cause water to go through the filter. 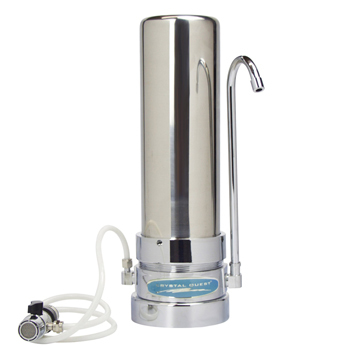 To stop water flow through the filter, turn diverter handle off, or turn off water at the faucet.